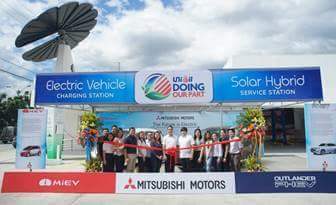 Unioil Petroleum Philippines Inc. (Unioil) has unveiled its first electric vehicle (EV) charging station on its newly-opened Unioil Solar Hybrid service station at Congressional Avenue Extension, Quezon City. The state-of-the-art Mitsubishi i-MiEV fully-electric vehicle and the Mitsubishi Outlander Plug-In Hybrid Electric Vehicle (PHEV) were showcased during the event. Present during the ribbon-cutting ceremony were Unioil Vice President Noel Soriano, Mitsubishi Motor Philippines Corporation (MMPC) Vice President for Business Planning and Public Relations Department Renato Lampano, and other guests. "We commend Unioil for its initiative to showcase renewable energy in its first hybrid gasoline station. 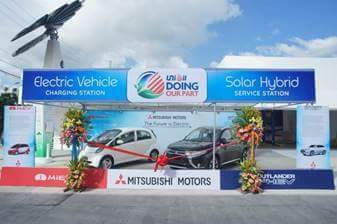 Like Unioil, Mitsubishi Motors Philippines Corporation is striving to reduce carbon footprint by developing technologies for improving fuel economy and electric-powered systems. The Mitsubishi Electric Vehicle (i-MiEV) and Outlander Plug-in Hybrid Electric Vehicle (PHEV) are proof of this concept," Lampano said. “We are very proud to open the first of many Unioil EV charging stations aimed at promoting the use of electric vehicles in the country. We invite everyone to visit our Unioil hybrid station to see and experience the future,” Soriano said. This latest effort is part of Unioil’s “Doing Our Part” campaign which the company launched in November to encourage Filipinos to make a difference in society through small, everyday actions and responsible decisions they make, including the decision to choose a cleaner fuel. Unioil believes that climate change and environmental degradation are real threats to a sustainable future and quality of life. This is why it continues to lead the way in introducing the cleanest range of petroleum products by offering a complete line of Euro5 performance fuels in September 2017, making it the first petroleum company to upgrade all its fuel products to Euro 5 standard. To further reduce its carbon footprint, Unioil has started operating its first “hybrid” service station which is partially powered by solar energy. The Unioil station along Congressional Avenue, Quezon City is equipped with the SmartflowerTM, the global leader in intelligent solar energy solutions that features an automated sun tracking technology, making it up to 40% more efficient than conventional fixed-type solar panels. Each SmartflowerTM unit reduces carbon footprint by 4.7 metric tons annually which is equivalent to planting approximately 5,000 trees per year. For more information on Unioil’s “Doing Our Part” campaign, visit www.unioil.com or its Facebook page.